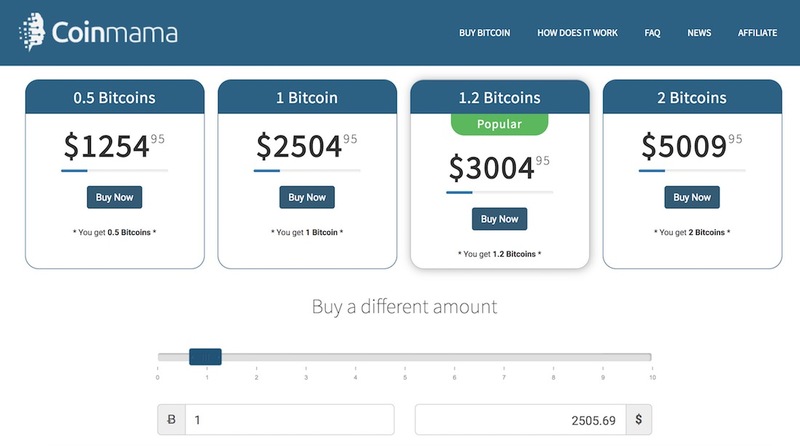 Coinmama Bitcoin Exchange Review – Legit or Scam? Coinmama is the Bitcoin exchange I use recently after reaching limits on the others. The exchange has been around for a while but I was hesitant to use it because I heard some complaints about their service. I gave it a try and here is the review. Coinmama is registered in Slovakia but they offer the service worldwide. You might have limited functions in some countries but overall, the service is available in the widest range of countries. You can buy Bitcoin or Ethereum with your credit/debit card. I used my debit card to buy because it’s faster, however, it’s also more expensive. I was quite disappointed with Coinmama’s customer support. The verification process was fast but when I had a request regarding my transaction, it took 2 days for the response. The good thing is that they explained thoroughly and keep me assured that I would receive my Bitcoin eventually. The 3rd transaction was completed within an hour when the service is less busy. The price you see on Coinmama’s homepage has a huge markup because it includes the service fee of 8.5%. If you pay with cash, you don’t have to pay any more fee. But if you use your credit/debit card, you will have to pay additional 5% for Simplex, the payment processor. And that’s not all, I had to pay the currency exchange rate for my bank as well, so the transactions become so expensive. You should expect a 15% markup for your purchase. Update: Coinmama now does their own processing which enables us to provide end-to-end support, and makes all transactions instant. The service fee is 5.50%, which is included in the prices on the website. Overall, Coinmama is a legit Bitcoin exchange but I don’t recommend it because of the high fees. You should only use their service when you can’t buy anywhere else. My card was charged $1000 and still have not received my bitcoin. They just cancelled my transaction and did not give my money back. They do not respond to any support mails. I am very angry and will never use them again. Beware do not make my mistake. Sorry for the terrible experience. How long did you wait before canceling the transaction? The transaction was not cancelled it was expired, however coinmama have been in contact with me today and explain why the transaction expired and i should be refunded in 48 hours. I am happy with the end result. Awesome, the support might be slow but I’m glad this is not a scam. Thanks for taking the time to update the readers on your situation. It did indeed take us a few hours to get to your email, and that’s something we’re looking to improve. We recently hired several support representatives and will continue that trend until we can reach our goal of 24/7 email and chat support. In the interest of transparency, I think it’s also important to add that when a credit card payment is not approved, what you see on your bank account is only an authorization check. This happens whether you buy shoes or bitcoins, but since crypto transactions are usually slower, it can take longer for your bank to void the check – which is probably why you noticed it. If you, or anyone else reading, have further questions about our service, feel free to contact us anytime. We’re happy to help. Is there any update on your situation? I have bought 3 ETH from COINMAMA at (6th of Nov) at 10:00 AM GMT. and till now its not showing at my wallet . I have checked with Coinmama support and they were saying that my order was successfully completed from their side. So, could you please help . What was your experience with Coinmama? sofia changed my wallet address and they lied about it….STAY AWAY.. This is an appalling site. I bought some ETH,after hours and hours they canceled my order for “technical” reasons but they are yet to refund my money. I bought some more and many hours later am still waiting for my ETH despite messages like “you will receive it in 15 mins”. I’m over $200 usd out of pocket. Just a horrible experience.